rec. Philharmonic Hall, Liverpool, 9-10 February 2013. There are perhaps fifty or so recordings already of Shostakovich's Fourth Symphony, a number of them the subject of critical acclaim. 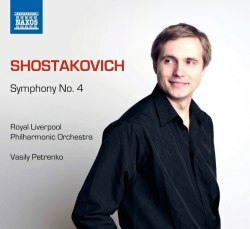 The RLPO's Shostakovich cycle under Vasily Petrenko for Naxos - this is volume nine already - has itself been highly praised. It is shaping up nicely as a contender among complete sets. Reviews of most of the key players in competition for the Fourth can be perused here. Kondrashin, Rozhdestvensky, Barshai, Rattle, Wigglesworth, Järvi, Jansons, Gergiev - these are among the favoured elite. We should not forget the long-deleted accounts by Ormandy and Previn. Whether Petrenko will be admitted to this echelon depends on a number of factors. As far as the objective ones go - is the conductor keeping to the score, does the orchestra perform to a high standard, is audio quality first-rate, is the overall product good value for money even - all the omens are good. Others are a matter of personal preference and opinion - does the conductor get to the beating heart of the work, does he overcook this or under-emphasise that? Like Petrenko's cycle so far, the Fourth Symphony itself has been the subject of much discussion, sometimes leaning towards hagiography. One review of Simon Rattle's recording in the 1990s referred to the work as "Revolution, October, the Winter of Discontent on the march. The shriek of the factory whistle, the piston-pumping roar of the Iron Foundry. Heroic workers unite. [...] equally an angry, cynical, almost psychotically rebellious nature." Most of that is nonsense. This is quintessential Shostakovich: not cataclysmic, shocking, savage - adjectives blithely applied to this work by melodramatic historians and ideologues - but proactive, sardonic, bombastic. Shostakovich wrote the Fourth in his late twenties, at a time when he pushed, like many young men, as hard as he dared against a bullying regime on the cusp of its murderous 'Great Purge'. He was no revolutionary, however. The exact circumstances of his withdrawal of the work ante premiere are still unknown; likewise it is impossible to know just how angry, or frightened, Shostakovich was at the time - later post-Stalin accounts from him, acquaintances and speculators are subject to normal historiographic pressures: political revisionism, memory limitations, misunderstandings and mistranslations. Though annotator Richard Whitehouse's claim for the work's 'seminal' status is hard to argue with, this cannot seriously be considered as one of the greatest symphonies of the 20th century, as is sometimes claimed - not by a long chalk, in fact. Shostakovich was clearly under the influence when he wrote the work - of Gustav Mahler, that is. The final movement is especially rife with Mahlerisms. No bad thing in itself but it dilutes any sense of originality. Petrenko's somewhat cool, almost detached amble through the score, particularly in the first movement, does little to restore it. Russian conductors have a knack of making the Fourth Symphony sound exciting, almost viscerally so in places, but Petrenko, for all the well-observed detail, arguably does not quite have the measure of it yet. On the other hand, perhaps he does, and some conductors, like some musicologists, read more into the entirety of the work than it entirely merits. The Naxos engineering on this occasion comes close to distortion in the loudest tutti sections, but manages to keep just the right side of it. In terms of clarity and detail, the recording is splendid - probably the best in the series to date. As usual, Richard Whitehouse's notes are detailed and well written, providing both a cultural and a technical account of the work.